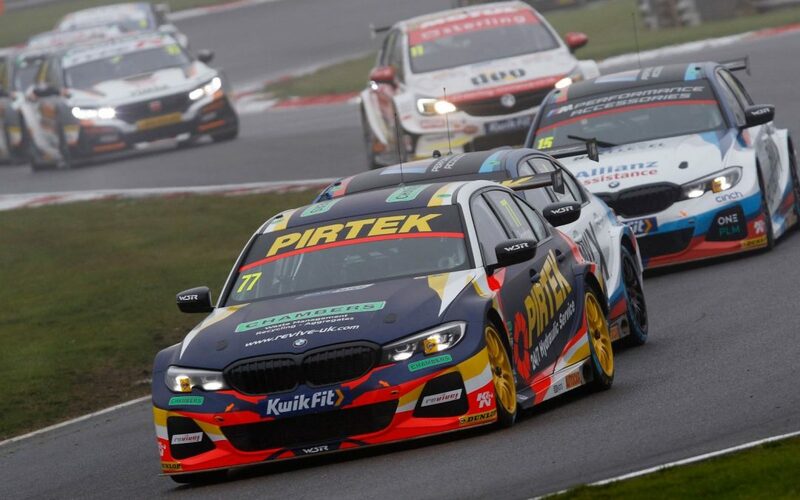 Andrew Jordan took a brilliant first victory for the brand-new BMW 330i M Sport at Brands Hatch at the opening British Touring Car Championship weekend of 2019. Treacherous track conditions had blighted the first race and the WSR-run team opted to start on Dunlop wet tyres, but once the race got underway, those further down the grid who had gambled on slicks proved quicker. Despite running second in the early stages, from third on the grid, the 2013 champion faded to 15th by the flag. Determined to fight back in Race Two, and equipped with the superior-on-the-day control tyre, Andrew rocketed off the line and by the end of lap one had passed seven cars. He then dispatched rival after rival in a scintillating display that culminated in him moving into the lead on the outside of the pit straight with eight laps to run. Fastest lap and a dominant win were just reward for a superb drive. With 54kg of success ballast and the option tyres underneath him, Andrew was never likely to repeat that performance from 11th on Race Three’s partially-reversed grid, but still he fought gamely in the top 10 before contact forced him to pit.